The term “supergroup” is used a lot these days and admittedly, I like to bandy it about often, when it is applicable to a band qualifying for it. Today’s subjects, MURDERER’S ROW, are, without question, absolutely a fair example to be labeled as such. The band, its members, the bands that each of them has connections to, all of these things add up to one stupendous collective of musicians. First, let’s begin with guitarist Bob Kulick, who some would call the “fifth member” of early era KISS. He worked on, and contributed to, such albums as ‘Alive II‘, ‘Unmasked‘, ‘Killers‘, and ‘Creatures Of The Night‘, along with Paul Stanley’s 1978 solo release. Kulick’s other contributions include working with Lou Reed, W.A.S.P., Michael Bolton, Motörhead, Meatloaf, Graham Bonnet, and many others, and yes, his younger brother Bruce was a guitarist in KISS at one time. Alongside Kulick in MURDERER’S ROW was singer David Glen Eisley, a powerhouse who had been the lead vocalist with Sorcery, Giuffria, and Dirty White Boy. Keyboardist Jimmy Waldo‘s resume included Alcatrazz, Graham Bonnet Band, New England, Blackthorne and Quiet Riot, while the band’s rhythm section, drummer Jay Schellen (Asia, Circa, YES, Hurricane), and bassist Chuck Wright (Quiet Riot, House Of Lords, Giuffria, Alice Cooper, Impellitteri) completed the MURDERER’S ROW line up. Though the band was short-lived, they did release a quite respectable, singular, self-titled album in 1996. It contained ten tracks of dynamic, hard-edged rock and melodic metal music with solid musicianship and impressive playing. However, the S/T album was not officially released in some territories at that time, which means there are some folks that may have no clue that the band ever existed, let alone issued a record… and that is unacceptable. But, good news! ‘Murderer’s Row‘ has been reissued from Cherry Red Records in an amazing, 2CD set. The second disc contains ten never-before-released, demo-quality songs – ones never even heard before, according to the band. Also included, a new essay from English journalist Malcolm Dome, compiled from recent interviews with Bob Kulick, Jimmy Waldo, and David Glen Eisley, discussing how the band formed and the making of the record initially. With these announcements comes a new, official video première for the song “India” from the album. When we say “new”, that is what we mean, as this clip was recently filmed for the song that is over 20 years old. Check out the video below, along with the reissued album’s artwork and track list. 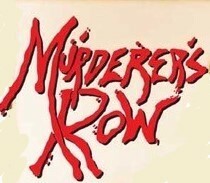 You can purchase ‘Murderer’s Row‘ now at this LINK.